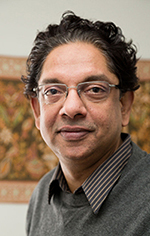 Ajit Zacharias is a senior scholar and director of the Institute's Distribution of Income and Wealth program. His research primarily focuses on the theory, measurement, and analysis of economic well-being and deprivation. Along with other Levy scholars, Zacharias has developed alternative measures of economic welfare and deprivation. The Levy Institute Measure of Economic Well-Being (LIMEW) offers a framework that accounts for how changes in labor markets, wealth accumulation, government spending and taxes, and household production shape the economic determinants of standard of living. Levy scholars have utilized the LIMEW to track trends in economic inequality and well-being in the United States. The Levy Institute Measure of Time and Income Poverty is aimed at revealing the nexus between income poverty and unpaid work. This measure has been applied to the study of poverty in several Latin American countries, Turkey, South Korea, Tanzania, and Ghana. "Class Structure and Economic Inequality" (with E. N. Wolff), Cambridge Journal of Economics, Vol. 37, No. 6 (November 2013). Zacharias holds an MA from the University of Bombay and a Ph.D. from The New School for Social Research.